I hope whoever is reading this now is not chewing qat. If you don’t know what qat is, let me give you a brief introduction. Qat is the son of plants, he’s lettuce’s cousin, and spinaches’ wicked brother! Qat is the green leaf that is chewed and stored in your left cheek if you are a pro, in your right cheek if you are a beginner, and in both sides if you are a dinosaur. I once saw a man who had to make a hole in between the qat packed into either cheek so smoke his cigarette! People chew everywhere, in the streets, inside shops, on the pavement, in hospitals, even in tourist destinations like Kamaran Dam. Somehow, a chewer always ends up in every picture you take. Families can’t anywhere without being disturbed by chewers who just sit there and stare. Families need to walk with portable partitions everywhere! Chewers have destroyed tourist spots with trash. Everywhere they go, they leave a trail of plastic bags, tissues, empty bottles, and green spit. The least you can do, when you finish chewing is pick up after yourself. Celebrities walk on the red carpet in some countries; here, they walk on green carpets of qat. Women fill their cheeks with Botox in order to look beautiful; here, men fill their cheeks with qat. Chewers, let’s be honest, is there a woman who looks elegant with balloon cheeks? And I don’t think women find balloon cheeks attractive in men. How can you flirt with girls in the street with a balloon cheek? Have you seen yourself in the mirror? And please, try not to laugh when you are chewing. Dear chewers on cars, busses, and on the streets, please be careful not to shower people when you talk to them. People need to start holding umbrellas when speaking with chewers. And please, please, please do not spit on the street. The street is not yours to spit on. We walk here, too. Soldiers in other countries are tall, broad-shouldered, clean, strong, and muscular. Our soldiers? They’re very skinny, very young, and you find them at checkpoints each with his cheeks packed to the limit. Our soldiers need to train to build muscles, and muscles are not built with qat. Qat in this country is the biggest money vacuum.When do you Yemenis stop chewing? When they’re broke. Let’s calculate it, if you spend YR1,000 a day on qat, cigarettes, and a drink that’s YR30,000 a month. If you spend YR2,000 a day on your habit, that’s YR60,000 a month. Some people might spend four or five thousand on their daily chew. You do the math. With this money, why don’t you sign up for a course, travel, or save money for a business? And worse, if you are a man that can’t give your young children money to buy sweets, or can’t buy pampers, oil, or rice for the house—why do you buy qat? There is something called priorities, and when you have a family, qat should not be the first. 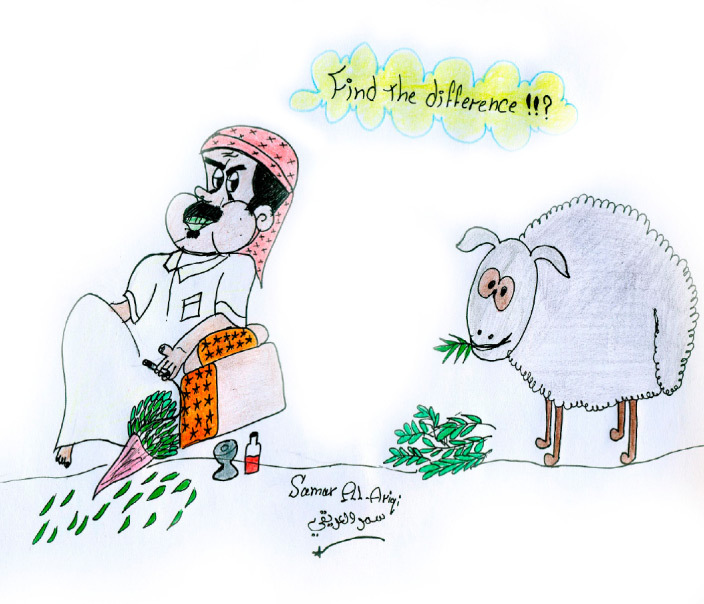 In Yemen there has been a lot of debate on whether qat is hallal or haram (allowed or prohibited in Islam). Some imams say it is haram because of the effects it has on an individual and the country. Others said it’s not encouraged and should be done under restrictions. Ironically, people who want to hear that it is “Halal” go to religious figures that chew and ask for their consultation. Qat in the end is something you chew on, and then spit it. So think before spending money on something that would be spitted out. If you’re an addict, I challenge you now to stop. Give it a try for a couple of months, and compare the difference financially and on your health. If you can’t stop it, try to limit your intake to once or twice a week, and if you can’t do that then chew without making “balloon cheeks”, and if you can’t even do that, stick to chewing at home.